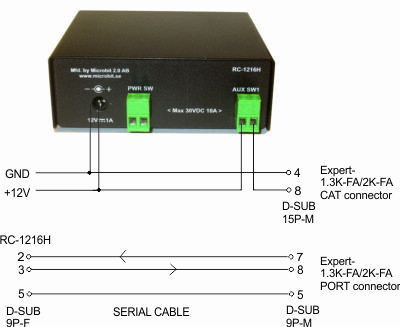 The RC-1216H is developed especially for remote control of Amateur radio accessories like Antennas, Power Amplifiers and Rotators via the Internet in a user-friendly and cost-effective way. 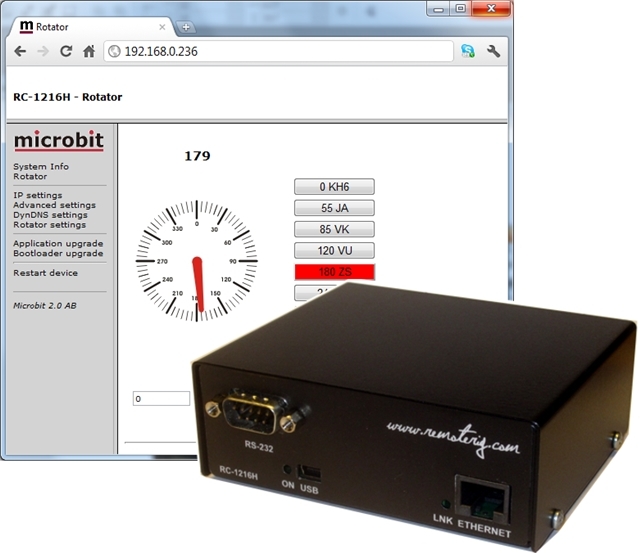 Lot of radio accessories are designed to be controlled from a PC via a serial port (RS-232). 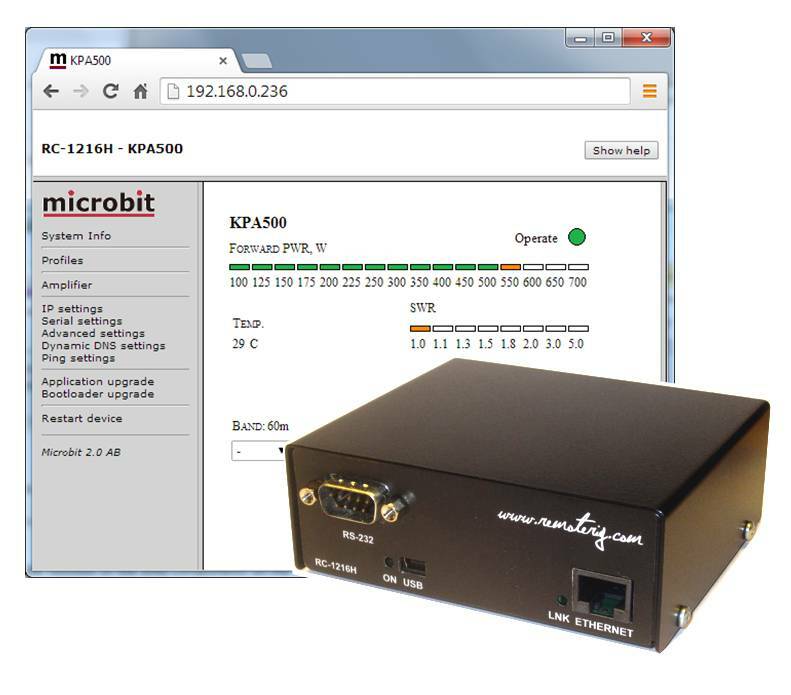 Serial ports are not very convenient to transfer over the Internet. 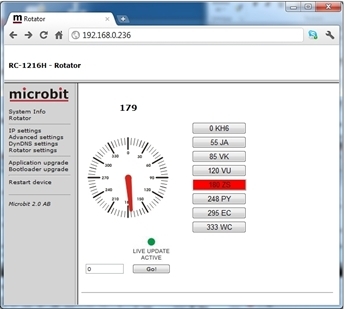 The RC-1216H acts as PC against the connected equipment at the same time as it shows a more user friendly web based user interface for the operator. 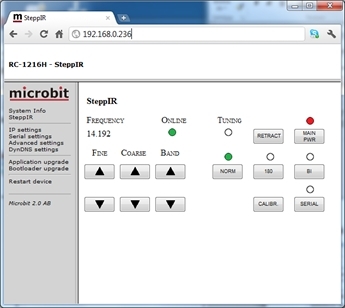 The web interface is much more convenient to use over the Internet as no special software need to be installed in the PC and it can be reach from any Internet connected PC around the world or any other device with a web browser like smartphones, pads etc.. For the moment the Remote control RC-1216H can be configured to control SteppIR antennas, the ACOM-2000A, Expert 1K-FA, 1.3K-FA,2K-FA and KPA500 Power Amps, Prositel Rotators, AlfaSpid Rotators, Green Heron controlled rotators, Yaesu Gs-232B controlled rotators and Rotators with a serial interface using the DCU-1 and Idiom Press protocol. 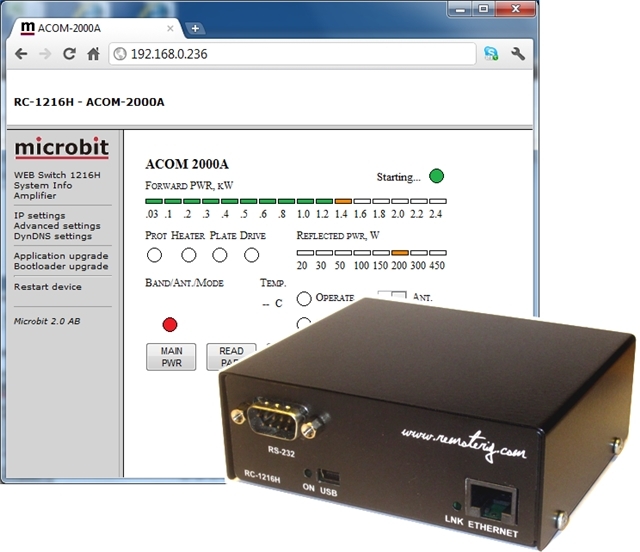 The RC-1216H can be configured to remote control a ACOM-2000A Power amplifier. The controls and indicators are almost the same as on ACOM-2000A control Panel (RCU) so you will recognize them immediately. There are controls for on/off, standby/operate, Auto tune, Antenna selections and a button for reading all parameters from the PA. The indicators are also the same as on the RCU like Forward power, Reflected power, Alarm LED:s, Band segment, Temp indicators etc. 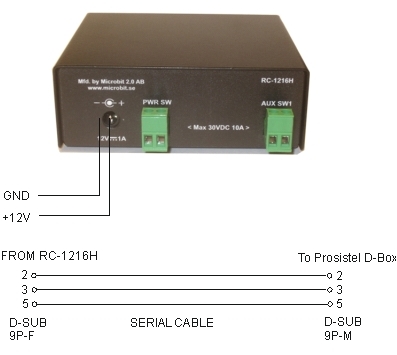 A serial cable has to be connected from the RC-1216H to the PA RS-232 port. If you also have the ACOM antenna switch you need to make a special Y-cable. An other cable is needed from the RC-1216H AUX-SW1 socket to the PA for Remote power on. This 2 wire cable can be soldered directly into the RCU D-sub or you can make a short extension cable where you connect the 2 wires. 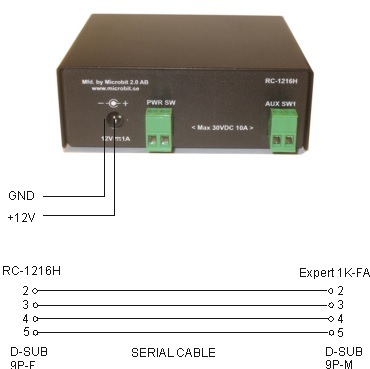 The RC-1216 can be configured to remote control a Expert 1K-FA, 1.3K-FA and 2K-FA Power amplifier. The controls and indicators are almost the same as on the front of the PA so you will recognize them immediately. There are controls for on/off, standby/operate, half/full power and a button for clearing the alarms. The indicators are also the same as on the PA like Forward power, Reflected power, Band segment, Temp indicators etc. The web based control is very handy to use specially when traveling etc, as you can control the PA from any device with a web browser like smartphones, pads etc. You also need to connect the PA direct to the radio to get the necessary control functions from the Radio. Remember that the RC-1216H is a complement to the remote control software from Expert, the radio connections are still needed. 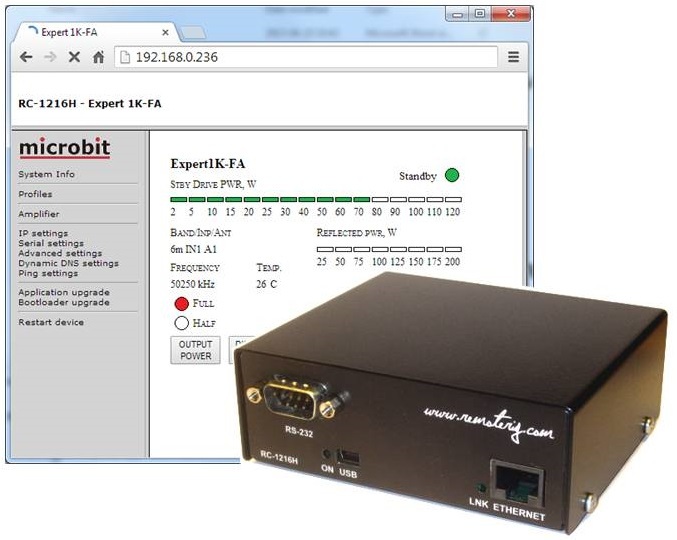 The RC-1216H can act as a serial port server in parallel with the web interface, meaning that you can use the Expert PC software to control the PA without doing any changes of the setup or connections. This is convenient if you need to change some settings like the automatic selection of antenna ports or other things which the web interface do not support. make a small modification if you want to use it for 1K-FA (see remoterig webiste under support). 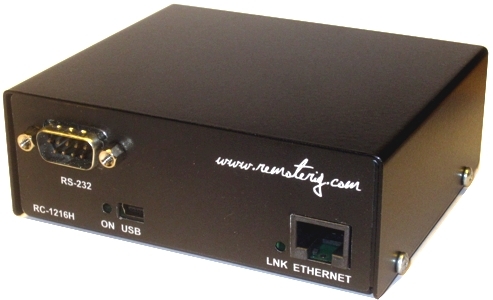 The RC-1216 can be configured to remote control a Elecraft KPA500 Power amplifier. The controls and indicators are almost the same as on the front of the PA so you will recognize them immediately. There are controls for on/off, standby/operate, and a button for clearing the alarms. The indicators are also the same as on the PA like Forward power, SWR power, Band, Temp indicators etc. 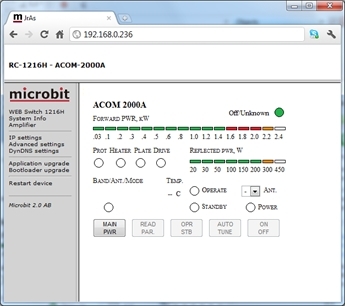 The web based control is very handy to use specially when traveling etc, as you can control the PA from any device with a web browser like smartphones, pads etc. 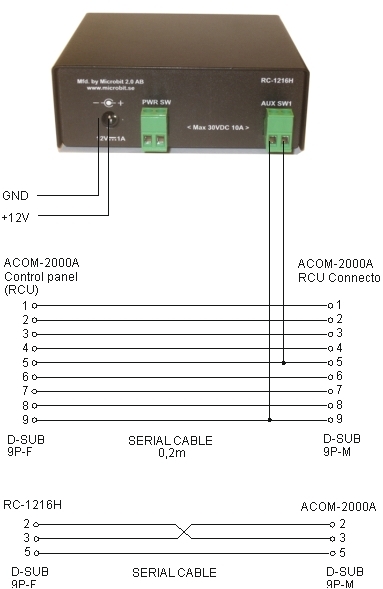 A serial cable has to be connected from the RC-1216H to the PA RS-232 port. It’s should be a standard RS-232 cable with straight connection 9PF -9PM. You also need to connect the PA to direct to the radio to get the necessary control functions from the Radio. Remember that the RC-1216H is a complement for remote control , the radio connections are still needed. 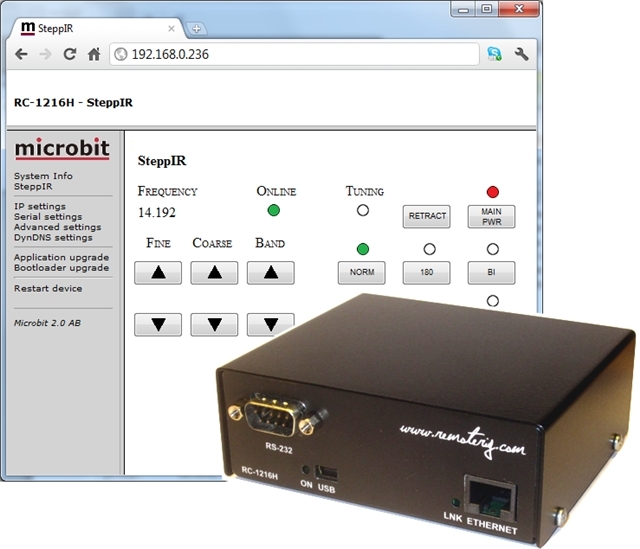 The RC-1216 can be configured to remote control a SteppIR antenna. The controls are the same as on the SDA-100 control box. You can use Retract, Calibrate, Bi-directional, 180 degree switch etc. Frequency adjustment can be done manual or automatic. 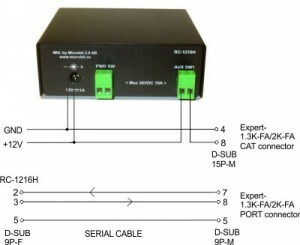 If you want the antenna to follow the radio automatically you need to connect a cable from the Radio to the SDA-100 Control box. If you want to be able to switch between automatic adjustment and manual you have to connect the data line from the radio to the SDA-100 via the RC-1216H AUX-SW1 Relay as there the SDA-100 protocol do not support switching on/off the Autotrack remotely (We hope they will implement it later). The AUX-SW1 relay is controlled by the “serial” button. The other buttons have the same function as on the SDA-100 control box. 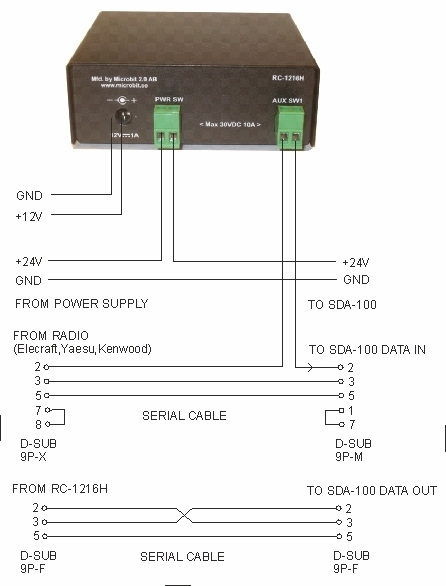 We recommend to connect the 24V power to the SDA-100 via the RC-1216H PWR-SW relay to minimize the risk for hang up situations. Be aware of that the SDA-100 need to have the Transceiver interface 01321 installled, it can be bougt from SteppIR for about USD85 and when you turn on he SDA-100 it should show 99 on the lower right of the display. The RC-1216 can be configured to remote control rotators. At this moment it support Prosistel rotators with the D-type control box, rotators controlled by Green Heron control box and other rotators with serial interfaces using the DCU-1 or Idiom press protocol. The controls and indicators are quite simple, you have digital azimuth indicator and analog indicator which shows the approximate direction. There are also 8 memory buttons which you can program to your favorite directions. 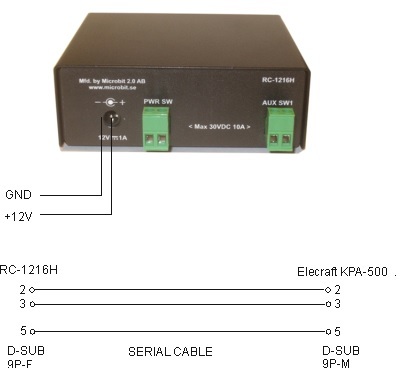 A serial cable has to be connected from the RC-1216H to the rotator Control box or serial interface. The example shows cabling for the Prosistel rotators. If you have others check the rotator manual for the connector pinning so you make proper cables. Standard installation of the RC-1216H and a Prosistel or AlfaSpid rotator.